4 digit bright LED position, SPM, etc. Many presses use separate controls for automation, die protection, load monitoring, and shut height control requiring a large control panel. With M1950, AVG introduces a modular compact control to replace a multitude of controls by a single control box, saving valuable panel space, and offering consistent user interface. The M1950 is designed for modularity and flexibility.The unit has 5 slots for plug-in modules, allowing any module to go in any slot.The modules can be used in any combination, up to a total of 5 modules. The microprocessor in the base unit takes care of the functions common to all modules.The intelligent modules have their own processors to perform their control functions, which allows multiprocessor architecture achieve fast response time from the control modules. 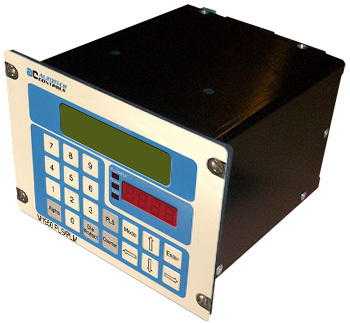 The base unit has a short circuit proof resolver input circuit which decodes resolver (coupled on drive train) signals and broadcasts press angle to all the slots.This allows the PLS, Die Protection, and Tonnage modules to share the same resolver. The front mount unit has a 2 line x 20 char LCD display for menu driven programming and for providing maximum information on one screen. A 4 digit of LEDs display is provided for displaying press slide position, SPM, and other commonly used parameters.The keypad provides hot keys to quickly access different modules.The keypad provides a full numeric keypad for direct entry of numerical information as well as 5 Simple Programming Keys common to several other autotech products. The M1950 has 5 slots for plug-in modules. AVG-Autotech offers several modules for press control & monitoring functions. Since all slots on M1950 are identical, any of the modules can be used in any slot and the modules can be used in any combination. Each channel can be used as Angle ON - Angle OFF, or as Angle ON - Time OFF. An Angle On - Time Off channel turns ON outputs at an angle for preset time.